What is a 3 day notice and why are they issued? A DEP 3 day notice is a notification issued to a property owner stating that their water line is leaking and must be repaired. There are many cases where a 3 day notice is issued and the DEP is more flexible with time span to repair the water line EX: if there is a small pinhole leak on the water main inside the house, the DEP may grant additional time to get the water main repaired. There are also scenarios where the water line leak is causing a potentially dangerous situation and the DEP may require that the water main be repaired immediately. EX: if the leak is causing a sinkhole in the roadway or if the water line leak is entering a neighboring house, it may be considered an emergency situation. If the water main leak is causing a hazardous condition the city may also issue a 10 day notice resulting in the water main being turned off in the roadway. In this case there is a $1,000 charge to the property owner which is in addition to the charges for the water main repair. Is your DEP 3 day notice accurate? At Harris Water it is standard protocol to first open the roadway at the “tap hole” and close the connection to the city main. In theory, if the water line is turned off for the house in violation, the water leak should stop and there should be no noise on the water main. If the tap connection is closed and the leak continues, it is possible that the 3 day notice was issued in error. At this point the contractor will call DEP to the location and have them verify that the leak is actually coming from another house. 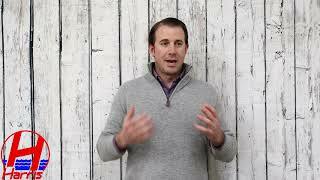 The homeowner is still responsible to pay the contractor as per contract. At this point the contractor should assist the homeowner in filling out all forms and submitting it to the city comptroller’s office for a reimbursement. How does the DEP know if the water main is leaking? 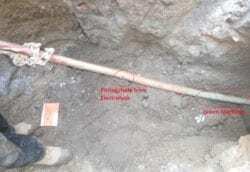 It is most common that the water main will have a sound test performed on the line which will confirm the source of the leak. The DEP will access all neighboring houses when they will perform a noise test on the water lines in question. They will turn off the main shut off valve controlling the water from the city water main to inside the building and perform the noise test. How does a sound test work? A private water main should be completely silent if all the water in the house is turned off, there should be no noise on the water main when you put your ear to the pipe. If you listen to the pipe while all water is turned off in the house and you hear a rumbling or vibration on the pipe, this is a strong indication that the pipe is leaking. It is possible that the leak of a neighbor’s house will cause a noise on a different water line; in this case the DEP will investigate all of the surrounding neighbor’s houses before issuing the 3 day notice accurately. How often does DEP issues a notice in error? 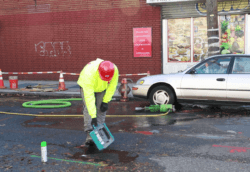 The DEP has a 99% accuracy rate when it comes to issuing DEP three day notices, the DEP field crew is extremely experienced and highly trained to perform a detailed assessment to verify the source of a leak. Harris Water Main & Sewer Contractors celebrates over 95 years and four generations installing new water mains and sewer lines throughout Brooklyn, Queens, Manhattan and the Bronx. 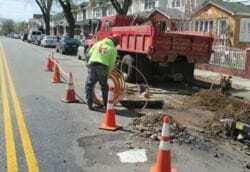 The family owned and operated business is available 24/7 for all questions and concerns regarding your water main or sewer line – 718-495-3600.